The Under 14s travelled to Drumaness for their 1st game of the season and won in great style. The foundation of this win was laid by the excellent work of our half backs and our midfield who worked tirelessly to win possession and fed the ball to our forwards who took some great scores. The interplay between the forwards was excellent. All 19 players contributed to an excellent result. Well Done to St. John's Senior Men on winning last night's Local Derby away to Liatroim Fontenoys. 2-10 to 1-09. Hitting the back of the net for St. John’s were Marty Keenan and Conor Mac Giolla Mhir. 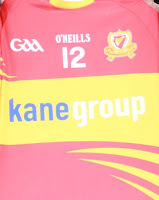 The points came from the boots of Marty Keenan, Conor Morgan and Harry Mc Mullan. 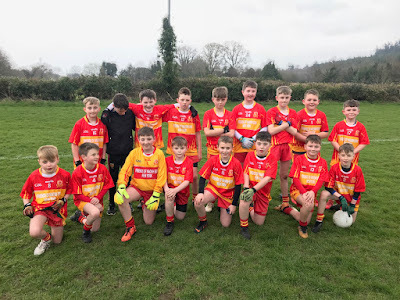 St Johns Under 12s started their 2019 league season with a trip to Annsborough to take on neighbours Aughlisnafin on Sunday morning. St Johns got off to a flying start with Conor McGrattan finding the net after being set up by Nathan Doran but the hosts responded almost immediately with a goal of their own to level the scores. St Johns then opened up a three point lead with points coming from John Joe McMullan and two from Ryan McCourt. Again Aughlisnafin responded and scored two points of their own before John Joe knocked over another point and then Dylan McMullan scored a point from a tight angle. Conor McGrattan then got his second goal of the game after great setup play from Jay Flanagan. Before the half time whistle Ryan McCourt scored a goal and Calum Cluskey scored points with the Fin scoring two of their own to leave the half time score as Aughlisnafin 1-4 St Johns 3-6. St Johns made a number of changes at half time and took their time finding their rhythm in the second half. The Fin opened the scoring with a point before Conor McCann scored a goal, flicking the ball past the advancing Fin goalkeeper. The Fin then scored a goal and a pointbefore Ryan McCourt scored another point after a solo run through the Fin defence. Jack McMullan then scored two points in between two points by the home side. Conor McCann scored another goal after a flick through from Conlan O’Boyle before Conlan got a point of his own. John Joe put the result beyond doubt with a powerful drive to the net after great setup play by Eoin McCreanor. Late on the Fin scored another goal before Jack McMullan rounded off the scoring with another point. The final score was Aughlisnafin 3-8 St Johns 6-11. The scoreline does not reflect how close a game this was as throughout the match Shea Murphy in nets was called on so many times to pull off some super saves to put in another commanding performance between the posts and only for him the final score would have been much closer. 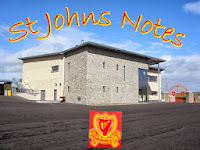 The St Johns defence of Eoin McCreanor, Mel Cahill, Joe Burns, Kevin Rogan, John Joe McMullan and Jay Flanagan were impressive in their defensive duties and supported the attack when they could. At midfield, Calum Cluskey, Shea O’Connor and Jack McMullan ran the legs off themselves and supported their defenders and attackers for the full fifty minutes. 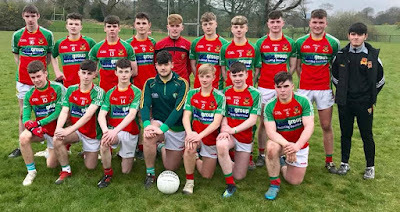 In attack, Ryan McCourt, Conor McGrattan, Conlan O’Boyle, Conor McCann, Nathan Doran and Dylan McMullan worked impressively as a unit and took some impressive scores throughout the match. Thanks to Aughlisnafin for hosting and to everyone who came along for their support. A special word of thanks to Mark Kelly and Liam Murray in the US who have sponsored the new Under 12s kit for the season. Well Done to Ballylough on their win against Rostrevor 3-18 to 5-7. This team just goes from strength to strength. No Jackpot Winner. 5,12,15 & 28. £10 winner was Ronan Burns. This week’s jackpot is £5650. Get your ticket renewed on Klubfunder.